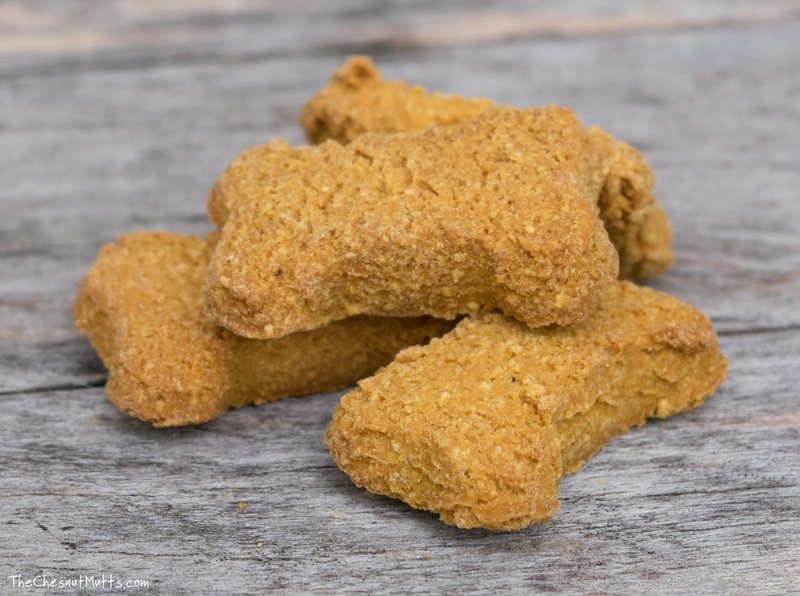 CBD dog treats are all the rage right now. Using the healing power of hemp without that high feeling can help people and animals with all types of pain and afflictions. The most common reason people use CBD for their pets is anxiety or pain. 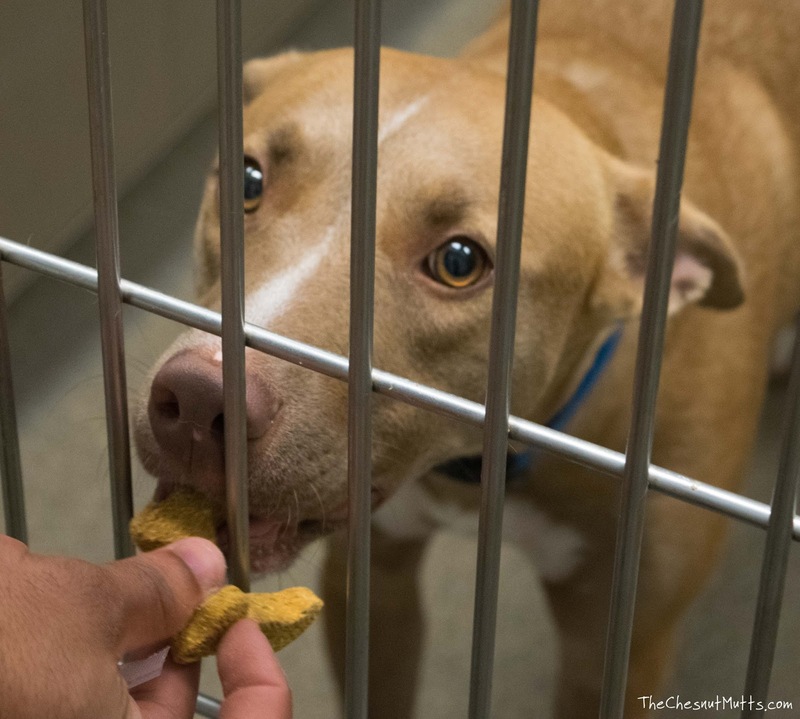 For some pets, it is a cure-all, but for others, it might take a higher dose to take the edge off. 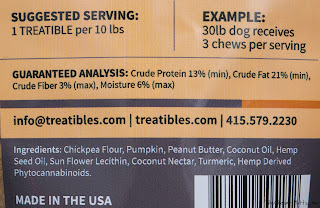 Either way, let me introduce you to the brand we are reviewing today: Treatibles®! All animals have an endocannabinoid system which has receptors all over the body that help with a wide variety of functions like digestion, immunity, and even emotions. Endocannabinoids are naturally made in the body, but if there is a deficiency, phytocannabinoids, which are found in plants like hemp and cannabis, can help restore and repair. Hemp vs Marijuana - am I getting my pet high? Treatibles is a company which focuses on hemp-based CBD treats for pets. CBD, a.k.a., cannabidiol is a phytocannabinoid which is found in cannabis plants. CBD provides pain relief while another phytocannabinoid, THC, is psychoactive and gives the user a high feeling. So what is the difference between hemp and marijuana? The levels of CBD and THC. The certain amount varies in different countries, but hemp has higher CBD with little to no THC, and marijuana has high THC amounts. Instead of industrial hemp imported from who knows where, which is widely used in supplements, Treatibles uses medicinal grade hemp grown right here in the U.S.A. and the oil extracted is phytocannabinoid rich and extracted from the whole plant. 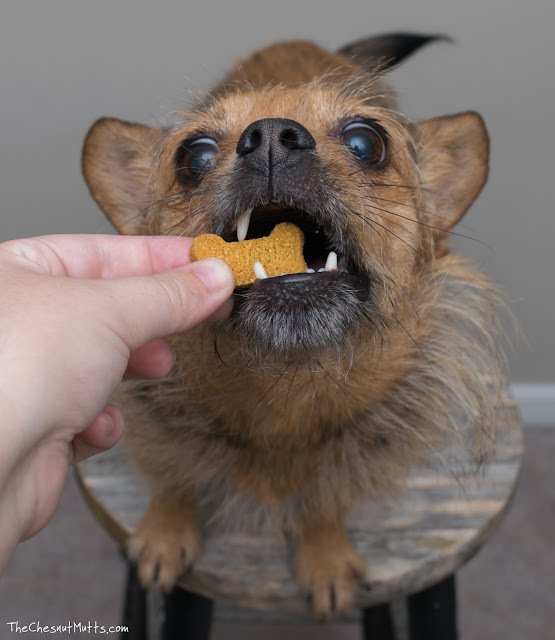 There is absolutely no THC in their line of products, but they do add other phytocannabinoids and terpenes (a natural anti-inflammatory, anti-bacterial, and anti-viral compound that may even help prevent cancer) to provide even more benefits to your pet. So what can CBD help with? A little bit of everything! 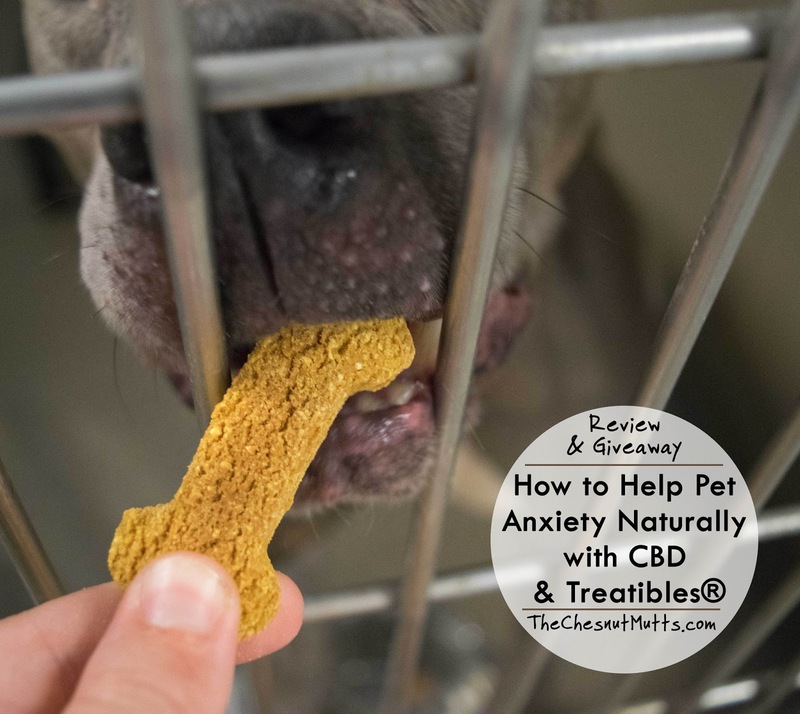 Most people will use CBD treats for anxiety or pain relief, but can be used for neurological conditions, arthritis, cancer, and many more conditions. 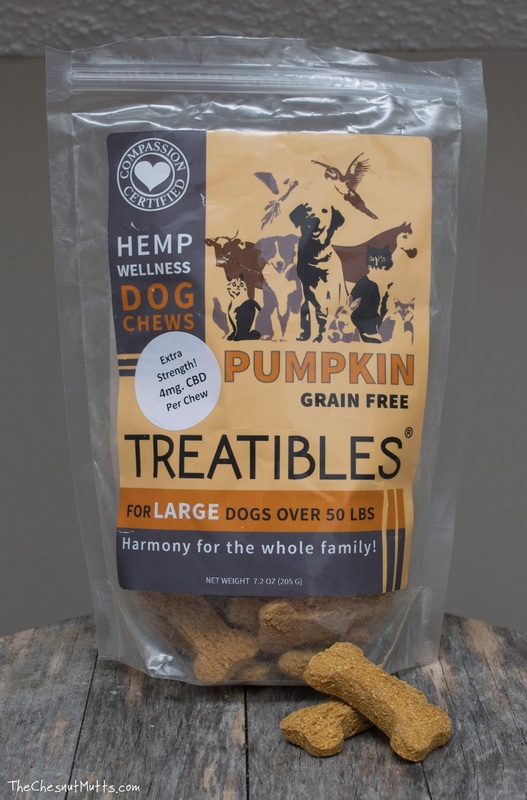 And because all animals have an endocannabinoid system, you can use Treatibles with all of your pets. As we look at the ingredient list, I see that it is mostly allergy friendly. It is a dry biscuit though, so if your dog or pet is picky you might want to try their oil to add to their food. 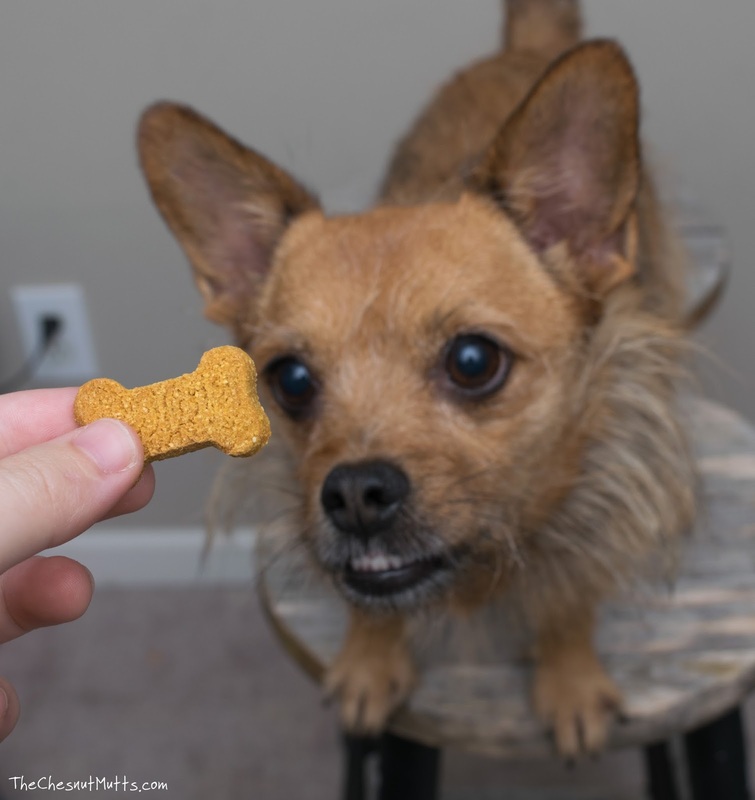 With this small dog version, 1 chew contains 1 mg of CBD and the suggested serving is one chew per 10 lbs. So what is great about CBD is that there is no risk of overdose. So if you try one chew and it has no effect on your pet, you can give them two next time or give another in a few hours. This is what happened with the girls. Jada weighs around 13 lbs and Bailey weighs 10 lbs. I went into this as testing an anxiety supplement, because that is what most people will use this for, including myself. Jada eats everything, so no problem there. Bailey will eat the treat after she sees Jada trying to steal it from her. She is very picky and the dryness was a problem with her, but she didn't completely refuse it. So we tried the initial suggested dose. No effect. Hm. Double dose? No effect. Funny story though is that we tried these out with a vet visit and I showed the treats to my vet. She said another patient of hers uses them with amazing results. Like the dog was completely different, in a good way, when visiting her. That was really awesome that in a small town someone else was using Treatibles already. I emailed Jodi, my Treatibles contact, that I wasn't seeing results like I wanted and she explained it could take a lot of chews to see a change. Knowing that there was no risk of overdose, just more chews to give, I tried a triple dose. We had a family get together at the house and the girls were loose with many people around. We started playing a board game and I noticed the girls were calmly sitting at my feet. Weird. Usually they would be anxious and be trying to get in my lap or pace around. I had given them the treats maybe less than an hour from that moment. So it seemed to take the edge off of the stressful situation and calmed them enough to lie down peacefully near my feet. Also note that they weren't drowsy. Every time I looked down at them, they looked right back at me with happy & alert eyes. 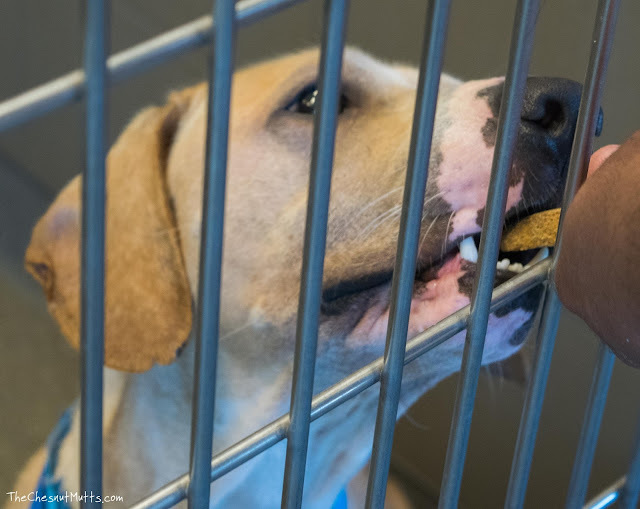 When I wrote to Jodi, I had another idea on how to test Treatibles with the dogs at PAWS (Public Animal Welfare Services) of Rome, GA. For those who don't know, I go out there weekly and take photos to help get them adopted. It is always a ruckus in there when it comes to noise and I was really interested in seeing if these treats could help these shelter dogs. Jodi sent over a couple of bags of large extra strength treats just for them. We gave each dog two chews since probably the average size was around 70 lbs. Most of the dogs ate the chews happily, while others were not interested or were too scared to get up and eat. While we waited to see if the chews worked, Johnny and I took photos for an hour. After everything was done it was a tad quieter. Two dogs who were barking their heads off as we approached the cage, were now calmly looking at us like any other content dog. That was utterly amazing. Having good results with the shelter dogs got me thinking about how CBD chews can be helpful for shelter dogs who have trouble finding a home. 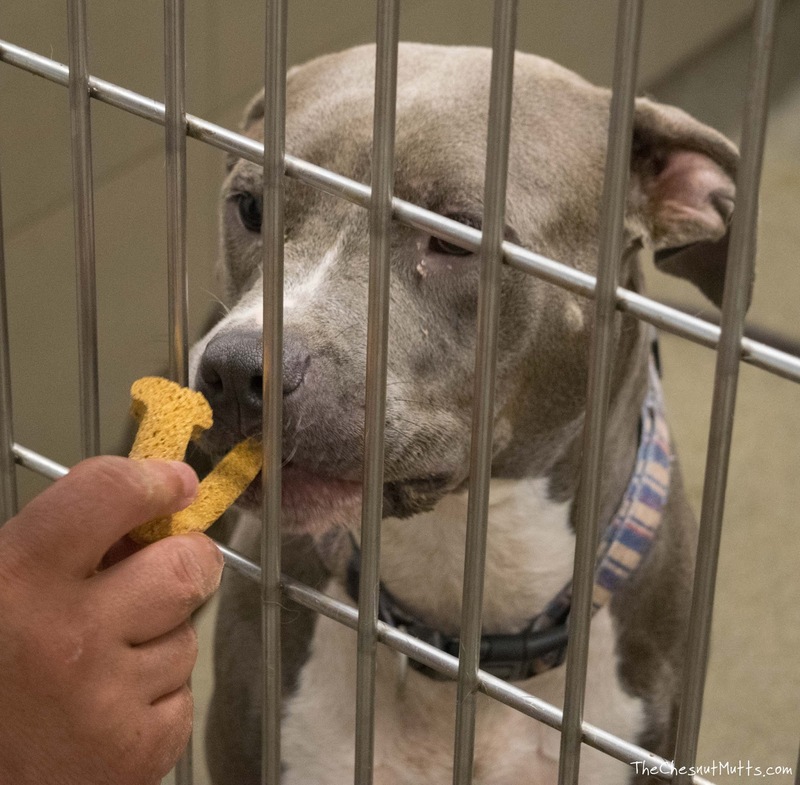 Some get stuck in quarantine for days on end because of their fear and if space is limited or the fear hasn't improved, the dog could be euthanized. Whether it is anxiety or a hidden pain making them fearful or aggressive, this could help with both! You can find Treatibles on their website and use the code "CHESNUTMUTT" for 10% off! Overall I love that CBD is becoming an ingredient in the pet industry. It really is useful and it is natural as well. Good ol' medicine from mother nature is always worth a try! Our only concern is that it may take a lot of chews for you to find that right amount for your pet. But once you find it, you can buy the larger treats to save you money and extra calories. Remember, every dog and animal is different. This could be a cure-all or just something to take the edge off. You might have to give very little or give a lot to get the desired effect. 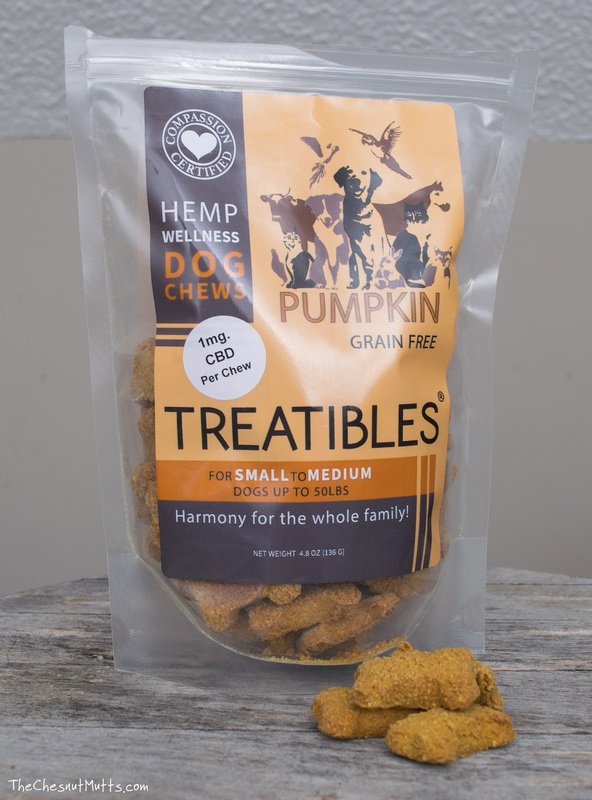 Treatibles is a great solution for pet parents who want to keep it natural when it comes to anxiety and pain relief! 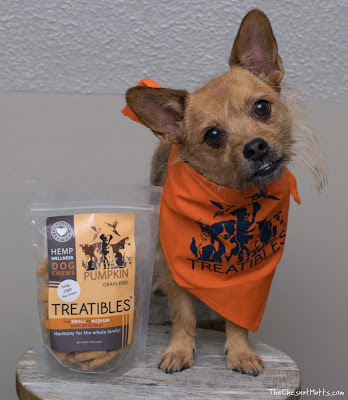 Treatibles just released their new line of chews and their grain-free pumpkin treats got an upgrade with a small change in ingredients (all good things), more chews per package (yay), and a change in the treat and package design. Otherwise, my review still stands as these changes would not change the outcome :). What are your thoughts about CBD for pets? By entering below, you agree to the Official Rules. I am very interested in this. I have one dog that is very anxious and shy. 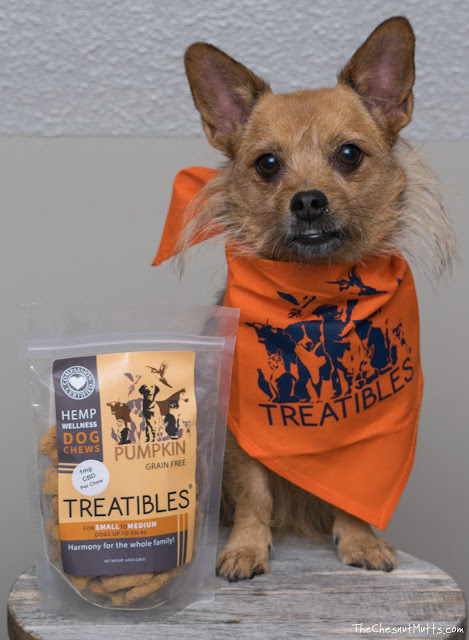 I have been using Treatibles treats and oil for about two months for my highly reactive and fearful rescue dog. Have noticed great results, much more calm, seems less fearful outside and doesn't seem to react to strange noises as much. It looks good never knew it existed before now. Sounds great, I'd like to try this for my Blackie who is afraid of thunder. Thanks for sharing. These treats are a great idea. Whenever a pet is in distress you want to do anything to help them. it might really help one of our dogs. She gets incredibly anxious. I am a huge fan of Treatibles and CBDs for dogs! i have read a lot of about CBD. i asked my vet about them as well. i would like to try them. i was interested in CBD for my oldest dog to see if they would help her with the cancer. however, she passed away recently. so i am interested in them to see how they work. it may help my middle child, now my oldest with getting her nails clipped, she gets so upset, she has to be sedated. i cant even clip her nails. So far, what I have read and what has been recommended to me all seems legit. 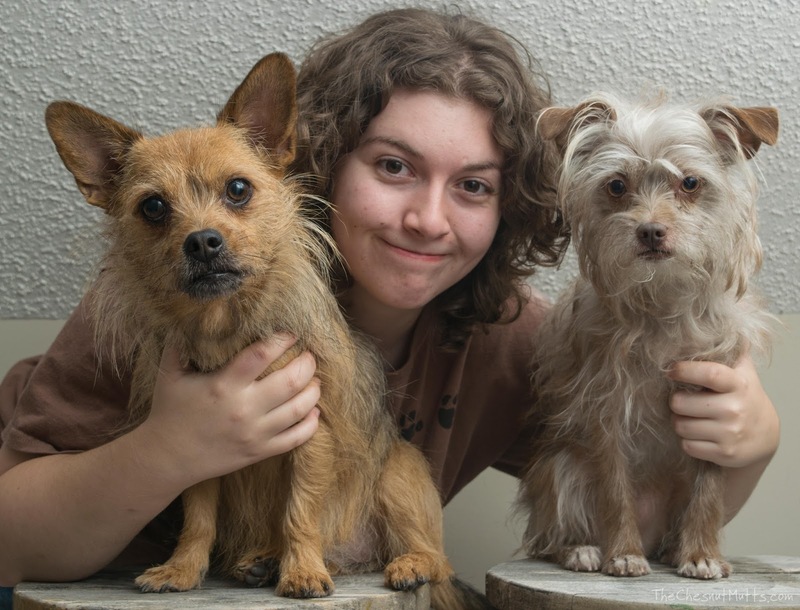 My dog has separation anxiety and I have been looking into CBD treatment. I have read nothing but good things on cbd oils. I think its an excellent idea. I wholeheartedly believe in the good things about CBD. Our Great Dane gets very anxious and could benefit! I have heard many good things. I love your blog, thank you so much!! I have not heard them but think they sound awesome! I have never used CBD nor know anyone who has. However, if it has benefits for us I imagine it does for pets. I am very excited to try these. My dog is very high strung and I would buy anything that helps. Thanks for the giveaway! I cannot say what my thoughts are on CBD. We have two Huskies, one of which is quite old now and has lost one front leg to cancer. She gets through the day fine, but she could have resigned herself to any feelings of pain. I would really like to try some of this product to see if there is any positive change in her daily routine. Thanks. First time hearing about this! I think it's great! I like the idea but not so sure my dogs would not be allergic to it. They are so sensitive to foods. I think CBD and even THC have their pace in the medical arena. If CBD is effective for pain relief, I am all for using it on humans or animals. Our dog Odin is quite old and stiff, if CBD will help count me in. My Chihuahua/MinPin mix Milo feels terrible anxiety if I leave him. Hard to know if this would help him because i wouldn't be there! I'll try when my son is at home. the good news is that he will eat anything. I use CBD oil everyday for my 12 year old Boston. It helps with his stiff joints, and I have seen improvement since starting. I believe it is a good thing. I've never heard of using CBDs for pets. I will have to try this out on our puppies around 4th of July! My pup Zeus anxiety can sometimes get the best if him. Love to try these! I have thought about using CBD for my girl Gypsy when she was here with us before she passed, for her seizures. Now I've been thinking about it for my anxious/separation anxiety 2 year old. I have tried these, and they are very effective! yes, you have to tinker with doasga initially, but they are awesome! 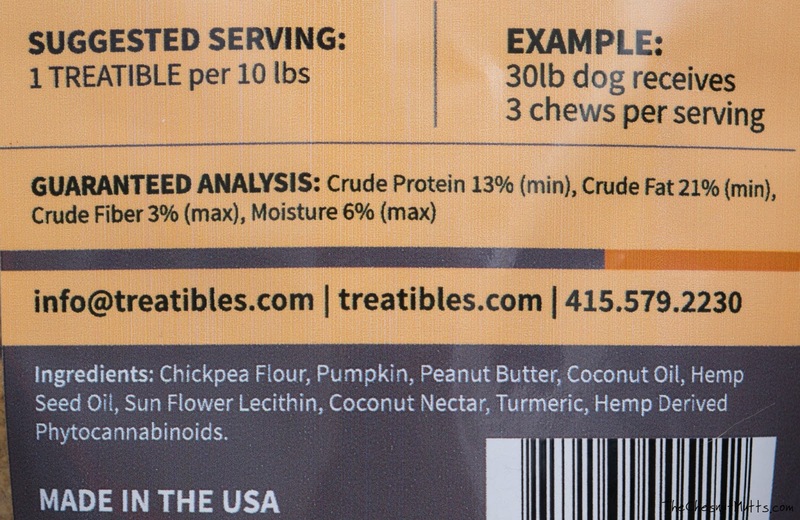 I like to use CBD for my dog and these treats would be used with the supplements. I have not tried it. Maybe it would help my dog relax when she is home alone instead of worrying about me. If it is beneficial it is good. With hunting season and even storms, I have one dog just trembles from loud bangs. I think it's great. I have a dog who is scared of loud noises. IOur poor baby is blind, diabetic and has arthritis bad. I want to help her all I can. I think at this really good, anything natural is better for my pup. 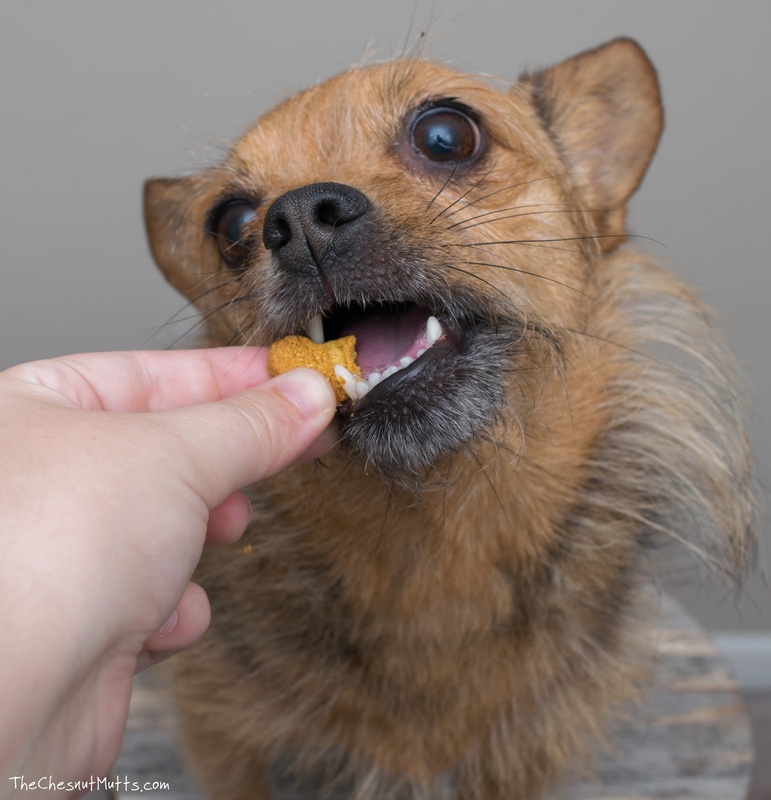 Anything that enriches a dog's life, especially if it has some anxiety or other health condition that could benefit from using CBD, I'm all for it. I have never heard of CBD for pets before. If it brings my dogs comfort all all for it. These are the same kind that we use! They are very helpful for small dog anxiety. 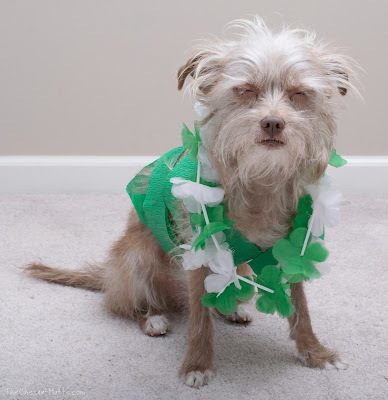 I have read a lot about CBD and i love to try this with my dog. My dog have an anxiety problem when i travel along with him. One of my friends recommended me about CBD and its results then i decided it to buy for my dog. Last week, I have order a CBD Product from Top Rated Hemp. And now, I have seen a very quick and good results in my dog. Now he looks very active and Energetic. I might check things out. I like what I see so now i'm following you. Look forward to looking at your web page yet again.